What causes T to decline? While aging does play a role, lifestyle can have the most significant impact. Stressful jobs, little or no exercise, sleep deprivation, and a poor diet can have a far greater effect on your testosterone levels. Let’s take a look at what changing one of these factors can do to raise your T levels: Exercise. A 10-week study (1) examined the effects of a heavy squat program on baseline hormone levels in two groups of men, one in their 30’s and the other in their 60’s. The routine consisted of four sets of 10-rep maximum squats with 90 seconds of rest between sets. 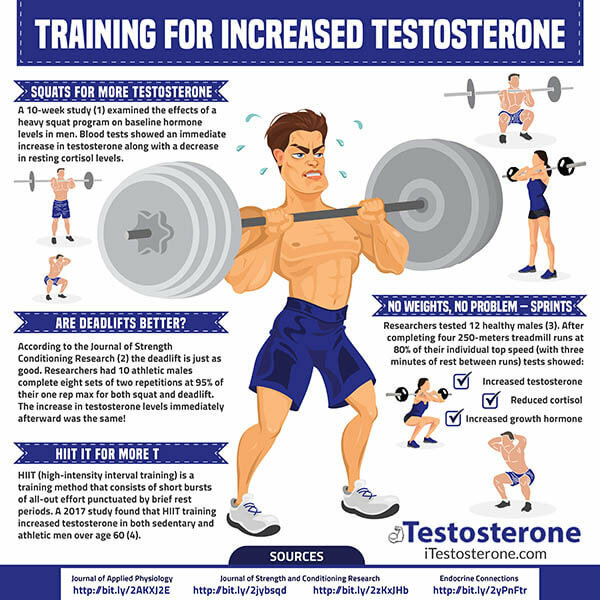 Blood tests showed that both groups experienced an immediate increase in testosterone along with a decrease in resting cortisol levels (cortisol inhibits testosterone) after completing the squat workout. This study proves that even in late middle-age, just doing moderately heavy squats can quickly increase your T levels. According to the Journal of Strength Conditioning Research (2), squats aren’t the only way to increase testosterone levels – because the deadlift is just as good. Researchers had 10 athletic males complete eight sets of two repetitions at 95% of their one rep max for both squat and deadlift. What they discovered was that the increase in T levels immediately afterward was the same! They concluded that the only difference was that squat training felt harder than the deadlift, so if you want a quick testosterone boost without too much fatigue, then skip the squats and pull some weight off the ground. Not everybody has regular access to a well-equipped gym; what can you do if circumstances keep you away from heavy lifting? 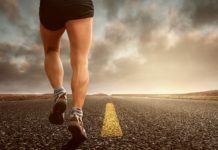 Although a slow long-distance run won’t help, it turns out that sprinting for short distances can raise testosterone levels just like squats and deadlift. 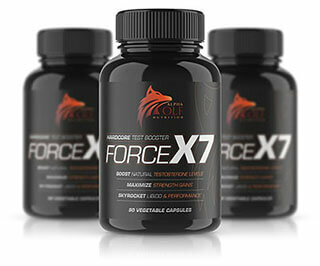 Face it; relying on a just few movements to naturally build up your testosterone levels can get boring. How about using a training protocol that can turn loads of different exercises into testosterone boosters? Consider doing high-intensity interval training (HIIT). HIIT is a training method that consists of short bursts of all-out effort punctuated by brief rest periods. A 2017 study found that HIIT training increased T in both sedentary and athletic men over age 60 (4). 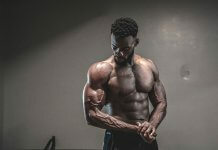 HIIT can be applied to calisthenics, weight-lifting, and cardio training to turn every workout into a chance to naturally give your testosterone levels a quick boost. GW Citroner's work has appeared in over 40 publications on a wide range of health, fitness, and medical topics.